﻿ Serpentine - Forum - Tips For Improving Your Game! Tips for improving your game! For those that play Serpentine regularly, or for that matter any online boggle or anagram game, here are some tips that might help you improve your game! 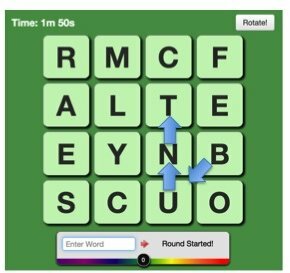 Remember that the way to win at Serpentine is to type as many correct words as possible in the allotted round time, so how can you do this, if you're struggling to keep up with the other players? The dictionary file that Serpentine uses, which is called the SOWPODS dictionary, has 173,528 words. It is pretty much impossible for any one person to memorize all of these, so if you see a combination of letters that you think might be a word, try it! You don't get penalized in this game for guessing, though you do need to make sure you're still getting correct guesses every now any then. But you'd be surprised how many words there are. 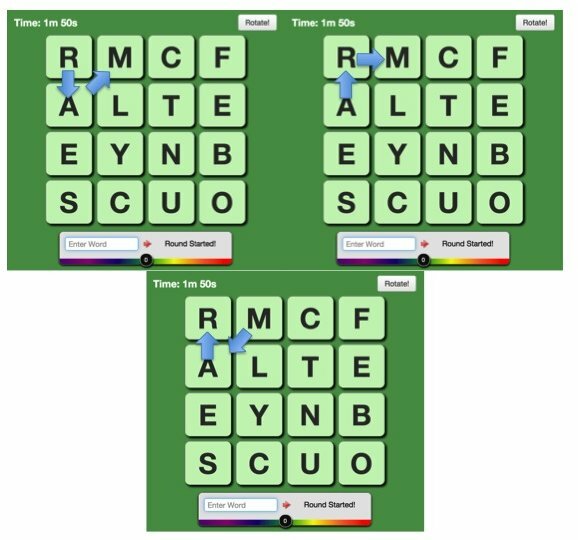 If you look at the three different boards here, the three tiles on the top left of the screen form three different words. You've got, ARM, MAR, and RAM! That right there is 3 very easy points! (More if you got there first) Especially for these shorter words, they often work backwards and forwards. You can see the word BUNT highlighted. But do you also see that BUN is also a word? Don't let these combinations give you the slip next time! Also, notice that the word NUB is in there, remember tip #2? Often times there will be a word like TASTE. This is a pretty simple word, but also a very flexible one! Think of all the combinations, and keep those combinations in mind the next time you see it! Off the top of my head I can think of TASTES, TASTED, TASTER, TASTERS, TASTIER, TASTING, TASTINGS, and TASTIEST. Keep in mind that when you have words like this that end in E you can often find Rs and Ds close by which should give you access to these other word forms. I really can't emphasize this one enough! If you only take away one tip today, this should be it. If you're someone that hunts-and-pecks or has a hard time typing quickly, this can really hurt your game if you tend to type words in (as opposed to mousing). This game thrives on quick fingers, so you may want to consider improving your typing by using a web app like keybr.com On the other hand, if you're mousing and you're using a touchpad, you may want a dedicated mouse! If you practice at these tips, you should start seeing some improvement over time. Serpentine/Boggle is not an easy game, and we have some VERY good players on here, so have patience and keep practicing! Also, let me know if you've got some additional tips and I'll post them! RE: Tips for improving your game! It's good to watch for front hooks and back hooks too. MEN takes A and O in front, D, O, and U on the end. Scrabble word lists show lots of front and back hooks. The dictionary file that Serpentine uses, which is called the SOWPODS dictionary, has 173,528 words. This is incorrect. SOWPODS has 267,751 words. Serpentine doesn't use SOWPODS and this can be quickly shown by running a sample Serpentine board through a SOWPODS solver such as these: http://www.dcode.fr/big-boggle-solver-5x5 http://www.wordplays.com/boggle-solver. I've done this many times and I won't dump a bunch of data here, but it's pretty glaring seeing the Serpentine word list and solved SOWPODS word list side by side. I'm not sure what dictionary Serpentine uses, but I would prefer if it was SOWPODS because I play various other word games which uses SOWPODS, which seems to be the gold standard for word game dictionaries going forward. As it stands, I have to remember which SOWPODS words don't work when I'm playing Serpentine. In conclusion, please switch to the current SOWPODS dictionary. Every new word game coming out will be using SOWPODS and it will only limit the new players that may be willing to play Serpentine if we are using a non-standard dictionary.